Dr. Dr. Julie Beischel has become the preeminent researcher of mediumship and after death communication. We’ve come along way toward gaining a scientific understanding of after death communication, mainly thanks to the work of one researcher, Dr. Juile Beischel. 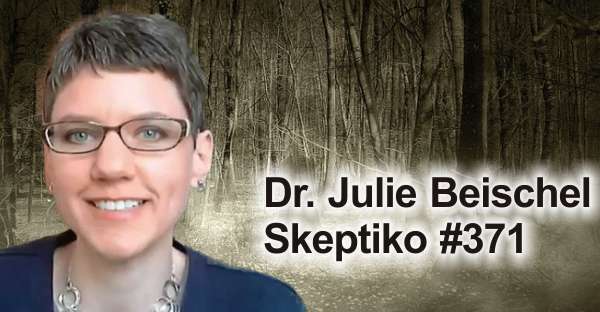 Julie returns to Skeptiko to talk about her latest work at the Windbridge Institute. Dr. Julie Beischel: Yeah. I’m really worried, they’re medicating young children as schizophrenic, because they’re saying they’re hearing voices. We try and take what we know and provide it to different audiences. I know how to speak researcher, so we’re working hard on trying to take this information and convey it in a way that, the general public, it’s good for them, clinicians, so they know about the reality. I was at conference with clinicians once, and I talked to one woman and she was tremendously surprised that the mediums on our team don’t walk up to people in the grocery store parking lot and give them messages. No, that’s completely unethical, our mediums don’t do that. They agree to a code of ethics and that includes, you don’t provide information to someone who didn’t ask for it, because you don’t know if they’re ready to hear it. That’s a very big concept to get your head around, and the grieving person might not be ready for it. What should the future of medium research be? Researchers should study what interests them. But funding will create "interest". Whatever is funded will be studied. Medium research would become mainstream if enough funding were available. My concern is that there is a huge crisis in mainstream science in that much published research is in doubt because it cannot be replicated. Whatever the causes are, medium research should avoid them. The academic pressure cooker, competition for government grants, corporations trying to make a profit, political correctness, "settled science", and paradigm fixation are part of the problem. So I think small private institutions might be a good way to produce high quality, ground breaking research. Hopefully the future of medium research will avoid the current problems of mainstream science and involve researchers and patrons studying what they think is most interesting. I think Julie is trying to encourage others to do studies as well using her own model, which seems to be pretty well thought out. I hope that whoever studies it does so with an open mind. They can be skeptical of it, but if you are not only skeptical of a claim, but combative towards it, you’re going to get the results you were looking for in the study regardless of anything, particularly if the data being analyzed is not strictly mathematical in nature. What is the future of medium research -- or maybe, what should be the future of medium research? Is it enough to stick to the practical issues of grief and all the problems our culture has created around dying? Is that enough, or should we be looking deeper at some fundamental questions that mediumship raises about science and the nature of consciousness? I'm not sure that "mediumship" is the right term to use. It implies that there's an entity that exists after death, an entity (the medium) that is currently alive, and that the former communicates with the latter. I have my doubts about this model. Yes. We probably need to be considering other models also. Another that comes to mind is something like the akashic record. I understand that that is a record of everything said or done by everyone in the past. Let's assume that some people are able to access this record. They might also have other paranormal abilities such as precognition or clairvoyance, etc., and be able to come up, from within their own capabilities, narratives based on this that are reasonably accurate, but without evoking the existence of a being that exists after death. This doesn't necessarily imply that there isn't some kind of existence after death, only that the medium is able by one means or another to extrapolate from the record. I suppose I have this problem with the idea that spirits have nothing better to do than contact mediums. They might sincerely believe that, but that doesn't make it so. The NDE data tells us how important that love is. And that we are cherished and loved. Spirits, in fact, probably do have nothing better to than contact their loved ones. Not in the sense that they lack important things to do, but in the sense that connectedness, Love, and caring, ARE the most important things. If this is true, which the medium and NDE data (along with all the thoughts of the wise men, shaman, and mystics) tells us, then contacting us would be a high priority. Leslie Kean talked in detail in her book about the “collective existing record” hypothesis in her book, but I can’t remember her reasons for suggesting that she thought it was an incomplete model which doesn’t fit all the facts,’just some. Of course this model should be considered and tested, if possible. But there’s no reason to accept it a priori when it’s really just as outrageous and bizarre as an afterlife and when the afterlife (survival) hypothesis fits the data just as well and is supported by other modes of understanding. The survival hypothesis doesn’t come from mediumship as strongly as it does from the NDE data along with extremely compelling reincarnation data, along with the experiences of ghosts. If all we had was the mediumship data, I’m not sure anybody on this forum would be so confident of existence after death. ESP is not produced by the brain. ESP is not dependent on space or time and it cannot be produced by any physical process including quantum entanglement. The existence of psi is evidence that consciousness is non-physical. If consciousness is non-physical, then super-psi loses any advantage a materialist might attribute to parsimony. Cross correspondences are cases where a message is given in parts through different mediums who don't know they are being used for in that way. The parts of the message only make sense when combined and contain highly specialized knowledge known by the spirit. This shows that spirits have initiative, problem solving ability, organizational ability, and retain highly specialized knowledge they had during life. Mrs. Piper: Evidence for Survival After Death Mrs Piper's mediumship shows that the characteristics of the communication varies with the spirit not the medium or sitters. For example some spirits are good communicators others are not, some communicate names easily others don't, most spirits have difficulty communicating shortly after death, most spirits become better communicators with practice. Super-psi does not Explain the Evidence for the Afterlife Guy Lyon Playfair, William Roll, and Ian Stevenson all thought poltergeist phenomenon that did not depend on the presence of any one individual were caused by spirits. When a child remembers a past life, and has a birthmark at a location of an injury in the past life, it suggests the spirit body may carry information from one life to the next. It would be absurd to believe the fetus was psychic and was fulfilling a psychological need by unconsciously creating the birth mark. Para-Pseudo-Skeptics Highly skilled psychics who live with the phenomena every day and know many details of the phenomena that never get published in parapsychology journals can tell the difference between ESP and spirit communication. They are the experts on the phenomenon and know infinitely more about it that any parapsychologist. To me, shared death experiences, along with the blind seeing and deaf hearing for the first time during NDE's, really totally blows the theory out of the water. Fantastic post by the way. Thanks for typing all of that out with links. Absolutely, and that's what I was getting at. Why invoke super psi? I get the feeling its because the overly sciencey mind is appalled and cant comprehend the thought of an afterlife, so super psi is invoked, while not realizing that super psi is really just as anti-materialistic as the survival hypothesis and offers much much less in the way of comprehensive explanatory power. And what qualification or experience do you have that would convince someone to believe you and not the mediums who experienced the phenomenon? They live with it 24/7 and know it better than anyone including professional parapsychologists. You think you are smarter than all the mediums. You can understand the phenomenon without ever experiencing it (I assume). Why? Some spirits do have better things to do and never come through mediums. Others have nothing more important to do than communicate with those whose grief they feel - which is why so many people who never go to mediums experience after death communication in one form or another. When you are in the non-physical realm, "I feel your pain" is literally true. They understand the grief of survivors, their doubts about the afterlife, the need to settle unfinished business, it affects the spirits, they want to help ease the pain of those they love ... and then move on to better things. In fact, I've experienced it. How else do you explain this kind of epxerience: A spirit came to me to give a message in mediumship class, it wasn't my turn to speak so I didn't say anything, but a few seconds later another more advanced student who wasn't afraid to speak out of turn gave the same message from the same spirit. After I refused to give the message the spirit tried someone else. It shows the spirits have initiative, problem solving abilities, and independent existence apart from the medium. I've also been in a trance mediumship workshop where I saw members of my class each allow a different spirit to speak through them. They weren't hypnotized. They weren't faking. I knew them personally. These and countless other experiences like them, not recounted in books by investigators and never heard of by armchair parapsychologists, but experienced by mediums day in and day out form their opinion. Many mediums can tell the difference between psychic perceptions in which they use the power of their own mind and spirit communication in which the mental impressions come from a spirit. Mediumship is of huge benefit to people suffering from grief. When you disparage it, you can do immense harm to people who are suffering from the unimaginable pain of losing loved ones including children. Absolutely, and that's what I was getting at. Why invoke super psi? I get the feeling its because the sciencey mind is appalled and cant comprehend the thought of an afterlife, so super psi is invoked, while not realizing that super psi is really just as anti-materialistic as the survival hypothesis and offers much much less in the way of comprehensive explanatory power. Our best chance to benefit from mediumship occurred back in the 1860's during the Spiritist movement initiated by Allen Kardec. He wrote several books based on information he received from mediums from around the world who were in contact with spirits of high order in the afterlife. These books were entitled, "The Spirit's Book", "The Medium's Book", and, "Heaven and Hell", among possibly others. They may be Googled up and read online free yet today. The information the spirits so graciously provided they urged Allen Kardec to publish as it was felt by them to be important for the advancement of souls on Earth and would promote peace. Unfortunately the movement was quashed by established religion of the time. Personally, I think it was a huge opportunity we simply lost. Tsk-tsk, Jim. No need to get personal. I haven't suggested that there isn't survival after death. I don't actually know whether there is or not, but believe there is, and that's the best I can say. If there is survival after death, there's only one way to find out for sure, and we'll all have to wait and see. You say that spirits possess "initiative, purpose, and problem solving ability". Well, so do human beings, and we know that different people place different interpretations on unusual experiences such as NDEs. Some perceive relatives or friends, some see religious figures, and so on. We can never extract reality from perception. Veridical aspects can be explained by ESP; OOBEs might be the gloss based on ESP by human beings who can't find any other framework for interpretation of what they experience other than by relating it to everyday perception. Then again, maybe spirits really do contact people in "real time" as it were. It just happens that I'm not convinced by that model. It could be correct, I suppose, but I retain a degree of scepticism. We can't even explain how ordinary perceptions relate to the qualia we experience, after all. If one is an idealist, and I am, then nothing is exactly as it seems. In general, there is certainly something real, but how we interpret it is dependent on how we perceive, and our perceptions are limited. If we perceive something, then we tend to think it's a literal truth and reify it. There's nothing wrong with that, it helps us negotiate reality in a way appropriate for our survival and learning in our present state. But when we die, either we cease to be (which I don't believe, although I don't know), or continue to be in some essential way. Why should the world as we presently perceive it be real? The only way I can think of is if we all become atheists and convince ourselves that death is the end: a complete annihilation. An alternative strategy might be to reify unusual phenomena within the framework of ordinary perception, so that we accept the existence of "spirits" and "mediums" and so forth. In its own way, (I mean no insult), this could be a kind of materialism extended to those types of phenomena. But what is really happening might be a different kettle of fish altogether. Like it or lump it, as presently instantiated, we are overwhelmingly governed by our perceptions and how we interpret them. We are designed to apprehend the world in more (or less) concrete terms as being composed of many apparently different and distinct objects. It is quite natural that we should interpret unusual phenomena within such a schema: we can't help it. But whether or not our various interpretations are literally so is a quite different, and more profound, question. After all, Alex asked us: should we be looking deeper at some fundamental questions that mediumship raises about science and the nature of consciousness? This is my answer: yes, I think we should be looking more deeply into fundamental questions, and not just those raised by mediumship. That was an interesting podcast, but it builds on previous interviews with Julie on Skeptiko, in which she explained the elaborate (not to say amazing) blinding procedure that she used in her medium research. Therefore, I would recommend that anyone who is new to this forum should check out her earlier interviews. To me the super-psi hypothesis is simply bad science. I mean materialism has at least a certain internal consistency (as opposed to consistency with the facts), and it has argued long and hard against ψ on the assumption that consciousness is a computation entirely constrained to the brain. Arguing about possible super-psi is rather like arguing that Special Relativity is false, and then when beaten back by the evidence, suggesting that one of the effects predicted by SR might be true, while still denying the rest of the theory! Indeed, materialists are quite happy to invoke super-psi one day, and argue that there is no evidence for ψ the next! Obviously I can't say that this kind of science has no right to go examining the 'droppings' of mediums. It may even eventually conclude that it is all okay. I have simply declined to buy the proposition that what I experience is likely to be a delusion, a hallucination, a misperception or a misinterpretation until some guy in a lab coat comes along with a seal of approval. We need to remember that Newton didn't 'discover' gravity - just the math involved. Gravity isn't a 'scientific' idea. Did we name it before Newton? I don't know. The point is that the only people who dispute mediumship and related things are [a] people who get bothered by the ideas and use 'science' as an excuse to dignify their distress, and religious types who want to control, or deny, access to spirits. Most normal and sensible folk whose minds have not been traumatised by propaganda don't have a real issue - just sensible questions based on genuine interest and curiosity. I just can't see that 'science' has anything fundamental to add to the conversation. There is sometimes a value in having an ignorant person asking carefully framed questions, because it can cut through poor thinking and erroneous ideas. And eventually that ignorance can grow into a decent enough understanding to offer new insights. That may comfort those who can't trust their own capacity for inquiry. But the bottom line is that mediumship [a rotten term actually] exists and persists because it is real. The really interesting question is - How useful is it? I think we are so seduced by materialistic thinking that we automatically privilege "How does it work?" above questions about how we can benefit from it. I have absolutely no idea how my iPhone works. Honest. I can probably burble on with some standard jargon, but I am completely clueless - and I do not care. In an age when science is privileged above religion we use the language of science to convey something that has nothing to do with understanding science at all. It signifies membership of a certain class or group. We don't use science language to convey science knowledge. And I suspect we use 'rational' arguments to convey anxieties about notions, rather than understanding. Communication with other than physical agents is as old as, I don't know... Tylor encountered 'savages' who thought the dead were still around, and he thought they were mistaken - got it wrong - because their intellects were not up to handling reality like an educated white man. So they imagined stuff that was wrong. That was the latter part of the 19th century. Tylor's scientific conceit remains with us, only now the 'savages' are weak minded white folk who are not blessed with a scientific education. Well I have 2 science degrees and I have had long conversations with non-physical agents -many hours. What benefit can we gain from this kind of thing? How do we know its stuff we can trust and use? This is what matters way more than the hows of it all. There is some argument about whether special relativity is correct, including articles in both Nature and Scientific American. I am not myself competent to judge, but my point is that consensus potentially always stands to be contradicted. You should know, bearing in mind your opposition to CAGW and doubts about the HIV-AIDS link (both of which I agree with, BTW*). Although I suppose I favour the super-psi explanation of mediumship, I don't see it as being in opposition to the survival hypothesis. I don't see why both can't be true. We could continue to exist after death, and yet not communicate with the living when we're discarnate. *Just to be clear, I agree with you about both CAGW and the HIV-AIDS link; I think they're both highly suspect).